I don't think it's an anti-West faction. Putting eight West teams in the tournament would mean putting one of every 4.75 West Region teams in the postseason and that would be a lot. It'll be interesting to see what it's like next year when there are two more teams in the postseason, and then in 2019 when we go to the regionals/super regionals format. I would at least think 3 National Champions in 5 years warrants 6 teams from the West. And, move 1-2 of them to other regions. I like the mixed regions concept and would give West chance to have 2 teams advance (like last years opportunity for PLU). That looked ugly as sin. Since they have to bring another starter back on 2 days rest tomorrow, expect more of the same. This pitching staff was not built for a tournament play obviously, but for three game weekends, once per week, in the California sunshine. Looking forward to their return to campus. I wonder if the LA Rams will take time from their events at CLU practice facility and congratulate them. The Rams sent a tweet right after the game as did Tom Herman, former Cal Lu football player and current head coach at the University of Texas. After avoiding the boards throughout the series I will say my piece regarding what just happened. I got to spend a few days in Tyler and a few days in Appleton watching Cal Lu and it just comes down to a team getting scorching hot at the right time. The team that was just crowned National Champs was probably not in the top 10 of most talented Cal Lu teams (not a shot at them) but they were able to accomplish what other teams came close to doing, but never got it done. These guys 100% played for each other and the chemistry was evident throughout the entire post-season. The way the players stayed calm throughout any type of adversity was something that has not been the norm in the past. I could go on and on about the whole deal but it is so good to finally see Cal Lu win it all. Also, the WS in Appleton was just a great experience all around. Cedar Rapids has a very tough act to follow. Nobody is arguing that we should have fewer than six, so not sure what you're getting at. The format coming in 2019 will allow for more flexibility, if the committee chooses to use it. But we'll also see a small handful of two-team/best-of-five regionals as well, since we won't have 64 teams in the postseason. Nobody may be arguing that there shouldn't be fewer than six West teams in the Regional's, but the recent history shows that the committee has selected less than 6 in 2017, 2016, 2014. And I believe there was actually only 4 in 2014. I am out of the loop (middle of my own season and in playoffs now... hard to keep track of everything)... Can you explain what is happening in 2019? I'm not positive on all of it but I think there will be 14 4-team regional and 2 2-team regionals with the winners being paired up in a 3 game super regional. I believe the 2-team regionals will be a best of 5 series. The NWC and SCIAC will likely play one regional and the ASC/SCAC will be paired up in another. Pool C teams from any of those conferences will obviously throw a kink into the plans. If anyone else has different info, please feel free to correct me. Wow... that's a huge change of format. Will really test pitching depth in those five-game series. But a real number 1 will win the best 3-of-5 in just three games, just like Cal LU did this year in the West. If the team loses in the first two rounds in a bracket of 4, they must play at least 5 games to win the tourney anyway. It is unlikely that the super regionals will be five game series. Not to say it would not happen but no other divisions plays a five game super regional and making such a departure is unlikely. In the past, they had two team series in the west while everyone played a four game bracket. This is more in line with reality than a five game super regional. The Supers will be 3 games but I would assume any regional that only has 2 teams would be a best of 5. Is that a fair assumption? I believe this to be a fair assumption, yes. 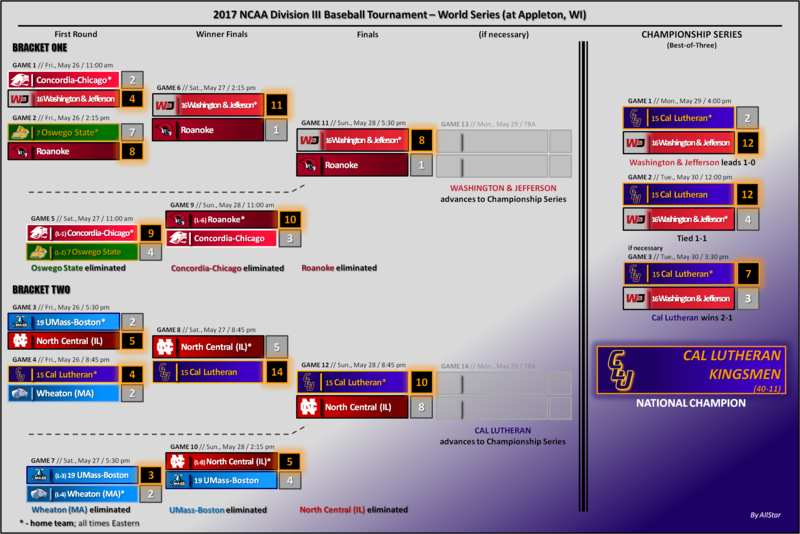 There was a lot of talk about Cal Lu's thin pitching but I looked at the bracket and found it interesting that W&J gave up a total of 6 runs in their first 4 games before giving up 19 runs on the final day.